Last year, I made this recipe on the fly for the first time. It is really simple, vegan, and utterly joyous! The sweet and smoky notes of our Apple Sage Sausage is a perfect addition to traditional stuffing, and easy! No one…not even your overly proud carnivorous uncle will miss the unmentionable turkey “parts” that are missing from this dish. Simply chop all your veggies, and sweat them in a skillet over medium heat in the Earth Balance. This takes about 10 minutes. This creates a great steamy atmosphere for the Field Roast to go into. One must NOT dry out the grain meat! I sliced the two links into rounds and then crumbled them into my now sauteed veggies with my hands. After a quick stir, I added the veggie stock and stuffing mix. I stirred to coat the mixture with the stock, and covered the pan for about 8 minutes. Voila! 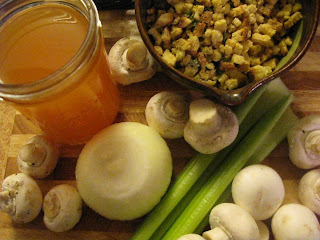 Tasty vegan stuffing! Another variation I might try is adding apples or butternut squash into the dish!